Can you relate to these conditions? Small distended capillaries accompanied by a red rash, which often forms pimples that contain pus and cysts. Without treatment bumps and pimples appear and become more extensive over time, along with burning, itching and stinging. 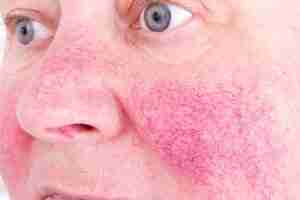 Rosacea is a vascular disorder that causes blood vessels to enlarge, which creates an increase of blood to the skin. Something in the blood stream triggers the blood vessels to swell, creating continual episodes of flushing and inflammation, especially around the cheeks and nose. Whilst there is some evidence it may be hereditary, no one really knows why it occurs. In dermatology this is referred to as dry rosacea, this condition gives the skin a grainy texture that feels almost dry to touch. Characteristically it shows as diffused redness across the nose and cheeks. This conditions is often referred to as acne rosacea. Inflamed papules and pustules appear in the skin with redness and inflammation, which often cracks due to dehydration. Causes of acne rosacea are largely unknown, but it is thought to be partly due to an impaired barrier. This is a severe type of rosacea that occurs on the eyelids and eyes. Symptoms include eye redness, swollen eyelids, small lumpy cysts and sometimes sty’s. This condition is interestingly more common in men. It’s a sub-type of rosacea that thickens the tissues; it can cause the nose to swell and growth in the nose cartilage. This article does a great job, of looking at what causes rosacea in more depth. Sadly many rosacea creams contain BENZOYL PEROXIDE a known irritant which should be avoided at all costs, as it may exacerbate symptoms. Instead, stick to soothing and strengthening formulas and natural antihistamine ingredients, like those found in Savior calming day cream; Containing natural anti-inflammatory’s that help to calm signs of flushing during a flare up. Diet is also important when dealing with all skin allergies and rosacea is no exception, so be sure to include Essential Fatty Acids – such as Omega 3, 6 & 9 as part of your diet, treating your skin from the inside out. Another interesting ingredient Pcynogenol, or pine bark extract, is believed to be a good natural remedy for symptoms of Rosacea, that has natural anti-inflammatory, antimicrobial and antioxidant properties. As you can see because it is such a complex condition, it is not easy to establish what causes rosacea. Head over to my article that looks at the treatment of rosacea, which will hopefully bring those rosacea prone skins, some much needed relief. I am a rosacea sufferer and find it so difficult to treat, once the skins barrier is impaired it is really hard to fix, do you have any suggestions, thanks in advance ..
Hi Angela. thanks for sharing that information, I have always thought that lactose can be a trigger behind rosacea flare ups, so it is good to have that reaffirmed.